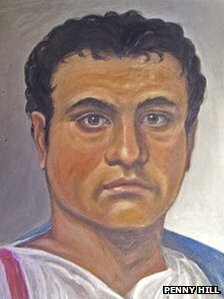 The face of a wealthy Roman citizen who lived in south Wales has been revealed nearly two millennia after he died. Using the latest technology, experts have produced a portrait of the man whose skeleton was uncovered 18 years ago in Caerleon, near Newport. Archaeologists are trying to fill in more details using forensic techniques employed by police. The image of the man was unveiled at the National Roman Legion Museum in Caerleon on Thursday. 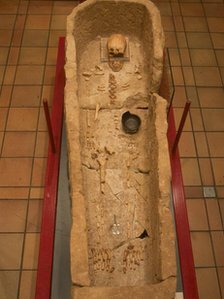 The remains from around AD200 were uncovered by builders who were working on the nearby Newport university campus in November 1995. Analysis showed the skeleton was that of a well-preserved man of about 40. Since it was put on display in 2002, the skeleton has become one of the museum's most popular exhibits, so staff decided to find out more about the man and create a portrait to honour him. Efforts to build a picture of how the man may have looked began three years ago. First, scientists carried out isotype analysis on the enamel of one of the skeleton's teeth. That revealed the man in the coffin had spent his childhood years, between the age of five and eight, in the Newport area and that he was probably a local boy. Curatorial officer Dr Mark Lewis said the man was living at a time when the Caerleon Roman fortress was at its height, having been established for 125 years. It would have been supplying the legion, serving up to 6,000 soldiers. "The fact that the man had been buried rather than cremated as most of the people were at that time was a clue to the fact he was probably well off," he said. "What we can learn from the latest evidence is that he may have been a very wealthy merchant who may have been supplying the fortress. "He may have been high up in the administration of the fortress. He may have even served in the army and come home to Wales for retirement." The fact that the research has shown that the man was a native of the local area was also important, said Dr Lewis. "Maybe his mother or grandmother married a Roman soldier, perhaps his father was a soldier and he followed him into the army." Dr Lewis said in future they make take their research into the man's origins further through DNA testing. As well as the scientific analysis, the museum commissioned a reconstruction of the man's face using forensic techniques. The skull was scanned to create a 3D digital model and two scientists worked in succession on digitally reconstructing the missing areas of the skull and creating a facial reconstruction. Because the museum wanted to hang a portrait of the Roman in its gallery, National Museum Wales conservator and artist Penny Hill then got involved. Ms Hill employed materials and artistic conventions known to have been used in Roman paintings or ancient literary sources. She said it was a challenging piece of experimental archaeology using a process called "encaustic" which involved creating the painting in wax.